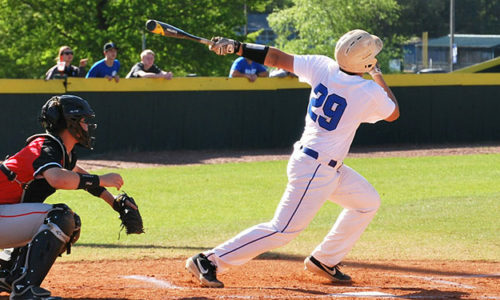 NORTH LITTLE ROCK — A three-run first highlighted by senior Matthew Sandidge’s two-run double backed the shutout pitching of freshman Austin Ledbetter and junior Coby Greiner as the Bryant Hornets earned a 5-0 win over the North Little Rock Charging Wildcats at Burns Park on Tuesday night. 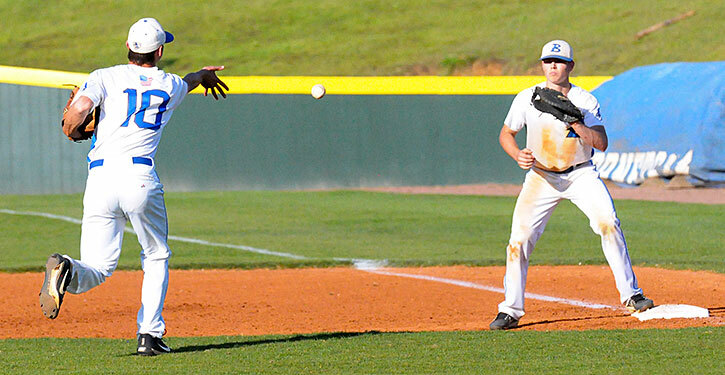 Bryant played errorless defense and turned three doubleplays in the game. The Hornets maintained a share of third place in the 7A-Central Conference. 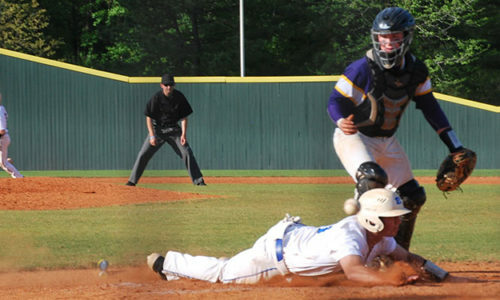 But, with Little Rock Catholic’s 10-8 win over previously unbeaten Conway, it means Bryant will probably need to be Conway themselves this Friday at home to earn the third-seed from the league for the 7A State Tournament. Catholic, tied for third now, takes on last-place Little Rock Central on Friday. If the two teams tie, the Hornets figure to have the tiebreaker in points and head-to-head differential. Bryant beat Catholic, 14-4, then the Rockets beat the Hornets, 3-2. Bryant was coming off a deeply disappointing 8-0 loss to Cabot at home that knocked them out of second place and a chance for a first-round bye at State. They got off to a fast start at North Little Rock, grabbing a 3-0 lead in the first, against the Cats’ ace right-hander Tucker Sparks. “Going back to last game, it was good to see,” acknowledged Hornets head coach Travis Queck. “That’s behind us. We tip our cap to Cabot and their pitcher. He did a good job against us. Ledbetter threw five scoreless innings. He fanned three, hit a pair of batters and scattered six hits inducing two of those doubleplays. Greiner finished, allowing two hits with two strikeouts to close the door after a rugged outing in the loss to Cabot. Sparks retired the first two Hornets in the opening inning before senior Scott Schmidt dumped a single into shallow left-center. Ledbetter, batting clean-up as a freshman, was hit in the head by the first pitch he saw. Fortunately, it was a glancing blow off the helmet. That brought up junior Jake Wright who belted a 1-2 pitch up the middle for an RBI single. A late throw to the plate, allowed Schmidt to reach third as Wright hustled into second. Sandidge followed and, after getting ahead in the count 2-0, drilled a shot into the right-field corner for his two-run double to make it 3-0. Of the six hits that Ledbetter surrendered, two were infield nubbers and two were bloops. Dezmond Cordova got one of the former with one out in the first then Weston McGhee one of the latter. But Christian Litton grounded into a force at second and Grant Shahan flew out to Myers Buck in right to end the threat. 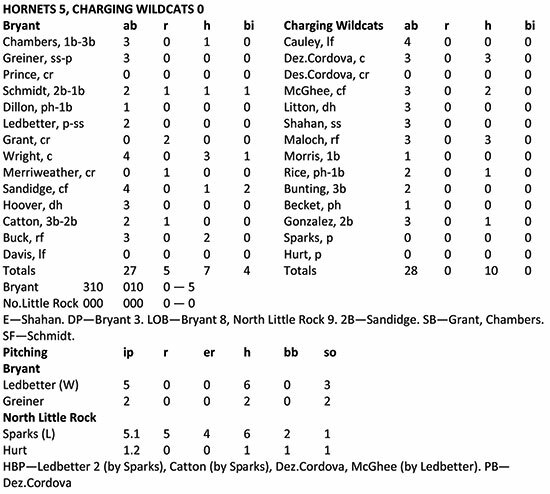 North Little Rock, even with Bryant’s three doubleplays, would strand nine in the game. In the top of the second, Logan Catton was plunked on the head in a very similar way as Ledbetter had. Buck got a bunt down and beat it out for a single. He and Wright would each had two hits in the game. Logan Chambers lined a single to left to load the bases and, with one out, Schmidt came through with a sacrifice fly to plate Catton, making it 4-0. John Henry Maloch, who had three hits in the game, blooped a single to right to lead off the home second but Ledbetter got Ben Morris to ground to Catton at third. He started the first of the Hornets’ doubleplays. Trent Bunting struck out. Sparks worked around a two-out walk to Brandon Hoover in the third. Ledbetter retired the first two in the bottom of the inning then struck Cordova with a pitch. McGhee beat out an infield hit but Litton tapped back to Ledbetter to end the frame. Chambers walked with one out in the top of the fourth, but the Hornets were unable to take advantage. Maloch, in turn, singled on a grounder up the middle, but Luke Rice bounced into the Hornets’ second twin-killing to send it to the fifth. Ledbetter was struck again on the first pitch of the inning. Logan Grant came on as a courtesy runner and, with two down, stole second and kept going to third when the pitch got past Cordova, the Cats’ catcher. Hoover followed with a grounder to deep short that resulted in an errant throw to first. Hoover was safe there and Grant scored to make it 5-0. In the bottom of the inning, Julian Gonzalez looped a single to left with one out and, with two down, Cordova laced a knock to left-center and took second on the throw towards third. McGhee was plunked on a 1-1 count, but Ledbetter came back to strike out Litton on three pitches to preserve the shutout. Despite hits from Buck and Wright plus a walk to Greiner over the last two innings, the Hornets didn’t really threaten reliever Hunter Hurt. Meanwhile, Greiner surrendered a pair of singles in the sixth with one away. But a grounder to Ledbetter at short started a rally-killing doubleplay to send it to the seventh. He pitched around a two-out single by Cordova in the bottom of the seventh, fanning two then ending it on a comebacker hit by McGhee. The Hornets finish against Conway on Friday then a non-conference tune-up for State against defending 6A champion Sheridan on Tuesday, May 8. The State tourney begins at Burns Park on Thursday, May 10. The last four times the State Tournament was held at Burns, Bryant won the State championship, though they did have first-round byes each time.